Relax and Enjoy The Curious Bear Cabin in Gatlinburg Private Perfect Location! The Curious Bear Cabin is a place you can relax with your loved ones in front of the fire or out on the deck enjoying the hot tub. We have just begun to rent this cabin again after rebuilding it from top to bottom and adding all new decor throughout everything is New from the dishes to the beds as well as a Brand New Hot Tub. If you would like to see our history of great reviews please check out vrbo.com/587624 for The Hiking Bear and you will see we take great pride in providing a wonderful cabin and caring for our guests during their stay. This luxurious cabin is located in Gatlinburg just 3 miles from the action on the main strip in Gatlinburg & everything on the parkway in Pigeon Forge and all the main attractions.You are only 1 mile to the Gatlinburg Welcome Center where you can take the trolley to all the fun in town. This cabin offers peace and serenity which will leave you feeling rested and relaxed. The fully equipped kitchen and gas grill will complete any culinary desires you may have. Enjoy a comfy night cuddled up, taking in the warmth of the fireplace. Enjoy the outdoors and do a little nature watching from the comfort of your own deck chairs or take in the sights and sounds of a peaceful evening. Being in the Smokies is a great place anytime of year. Cades Cove is near by and a great place to take a hike and take in all the Beauty of the Smoky Mountains. And since we are pet friendly you don't have to leave your dog at home. There is level parking and you are only about 10 minutes from the main parkway in Pigeon Forge, close enough to be part of the action but far enough to enjoy the quiet nature. We hope you enjoy The Curious Bear and we are happy you have chosen Gatlinburg for your vacation getaway. If you would like to see our other property in Pigeon Forge/Sevierville you can look at our reviews as well www.vrbo/587624 The Hiking Bear is a one bedroom cabin with a sleeper sofa it has been renting for over a year and has wonderful reviews. Please note: We are close to Westgate, however we are not part of the Westgate Resort. This is a private cabin. 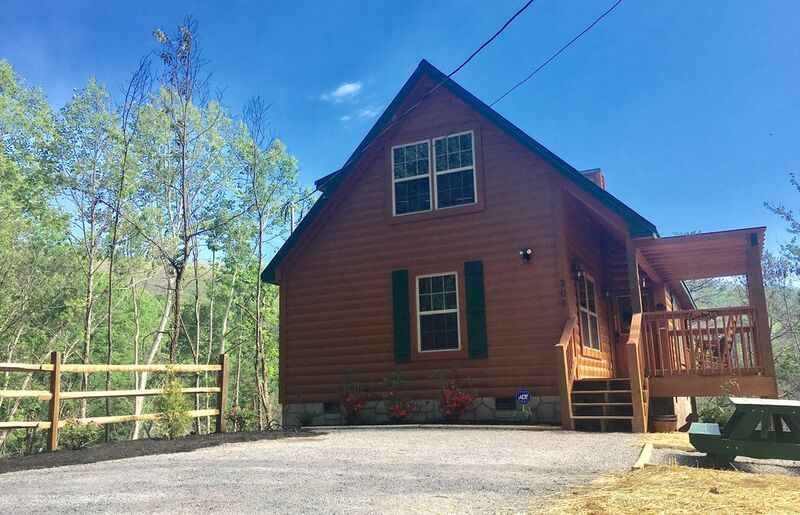 We chose this cabin in Gatlinburg because we love being close to the town and all the festivals and action, yet we are in in a private area secluded and surrounded by nature. You get the best of both worlds. We have been visiting Gatlinburg for 10 years now and there is always new and old things we cant wait to do each time we are here. You will love the area and all the things to do. Only 3 Miles to Everything in Gatlinburg! Our family had a great time at The Curious Bear. The cottage was immaculate, great size and well appointed. The location really is ideal being tucked away in the woods but close to Gatlinburg and Pigeon Forge! We highly recommend! The Curious Bear is very well located between Gatlinburg and Pigeon Forge and close to both. The cabin is done up very well, with thought applied to everything that a guest would require. Getting there from route 321 is much easier than the Kings Ridge route that Google made us use once....that route could be a bit of a challenge if there are heavy rains or it is dark. 321 has an easy and direct route. The hosts were polite in their messages and helped whenever we messaged them with a query. Would definitely recommend this mountain getaway. The Curious Bear was a wonderful cabin for our family. It was in a great location between Gatlinburg and Pigeon Forge, and close to the park entrance. I really appreciate having two twin beds for the kids (and the beds are very comfortable). We loved having the hot tub on the deck to relax in at night. Thanks for a great stay! Great place. Worked well for our family! We were able to have a relaxing weekend away from the normalcy of life. Just what we needed to recharge! Wonderful cabin. It was perfectly set between Gatlinburg and Pigeon Forge. Hope to go back! The Curious Bear Cabin is super clean and cozy. Its location is very private yet only five minutes from town. You'll have everything you need plus more in this cozy little cabin in the woods. Jennifer was extremely pleasant and accommodating, making our reservation/stay super easy. We will definitely revisit this gorgeous rental in the future! Thank you, Jennifer, for sharing this little gem with us!! We are located in an ideal location only 3 miles to the strip in Gatlinburg and minutes to all the fun of Pigeon Forge. There is so much to see and do in the area. Yet the cabin is nicely secluded and private in a wooded setting so you really get the feel of being in the Smoky Mountains without being too far from anything.